Somewhere around minute 17 of Apple's iPhone 4 event on September 1st, 2010 – Steve Jobs announced a change in a limited, early adopter-centric product: AirTunes had become Airplay. Honestly, in an event that included a Steve Jobs presentation and a new iPhone, most of my attention was focused elsewhere (Quick autobiographical detail: I flew from Caracas to San Francisco to see what turned out to be the introduction of the first iPhone, in 2007) – If only I had realized, what that change meant for me and my business. Presentations are important to me. I have seen lives changed by the right message, delivered by the right person at the right time. The ability to speak in public and help others improve their own abilities, has improved my life and given me a treasured career. My decade at ERC has been full of changes in virtual, time-shifted and long-distance presentations. Millions have attended presentations delivered from around the world, many thousands have delivered them. But in-person presentations have changed little. Technologies like smartphones, tablets, connected TVs and, yes, Airplay (as well as Android and Windows-based peers) will change in-person presentations – quickly. AppleTV is an experimental product that is perpetually high-potential. The last two or three years have ended with speculation about Apple's Living Room Strategy – The discussion usually begins with the AppleTV and related future products. I believe the AppleTV has a place in the boardroom. Connect the device to a flat panel screen or a projector, and you have a presentation tool that offers presenters a great deal of power and flexibility – whether your content is based on your computer, tablet or smartphone. Presentations look beautiful on phones and tablets. This trend will improve continuously, as people move more computer activity to devices and the cloud. 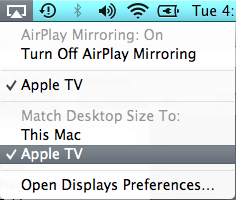 Airplay Mirroring (and related technologies) allow you to project whatever is on your small screen on the big screen. Need to show and demo a live web page? open it on your browser, tap, pinch-to-zoom. Brainstorm collaboratively or draw, live on screen, no need for a flip chart. The possibilities are endless when you mirror your camera app: from showing a small object, to showing yourself or even the audience – live on-screen. Photos, music and videos are easy and you can walk your audience through any document – without a remote. Your level of control is amazing. Like a disc jockey with music, you can seamlessly switch between different streams of content on different devices. Planning is key, but if you have a point you wish to prove through Angry Birds, it has never been easier. The future looks interesting for presenters – We must continuously improve our skills, as our toys become cooler.